Look at the picture above. It is a representation of something that takes place twice each year. 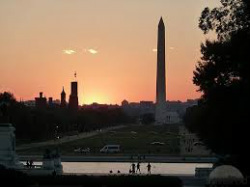 If the weather is clear, anyone standing at the centre of the bottom of the west Capitol steps and looking west at 6.45 pm on September 17th will see the Sun standing exactly on top of the Washington Monument. At that instant, the shadow of the Monument will pass straight down the Mall and its point will look like an arrow at the top of the Capitol steps, pointing to its doors. This is very appropriate, because September 17th is Constitution Day and the Capitol is an architectural and practical representation of the American Constitution at work. This event happens once more each year from this location, on March 25th, which is equally famous - but certainly not to everyone! I have been looking closely at Washington DC, its layout and architecture for a number of years. This website and some of my other sites detail the amazing discoveries I have made. Much of this information can also be found in my book 'Washington DC - City of the Goddess'. Collectively it led me to the conclusion that from the moment it was planned, Washington DC has served two completely different audiences. First of all there was the people who lived in or visited the United State's capital but who knew little about it beyond what they could see with their own eyes. Secondly, there was a very small and select group who had been responsible for all that lies below the surface. Much of this is extremely surprising and some of it is postively astonishing. In most cases it too can be seen, but only if one knows where to look, and when. For those who were willing to come on the journey with me, the evidence was compelling but to get the full picture there was a level of understanding needed about ancient measuring systems and archaic symbolism. What I never came across before was events anyone could stand and look at, and know in an instant that something very strange and quite fantastic was and still is taking place in Washington DC - something that as far as I am aware is compltely unique. There are similar displays on offer from the Washington Monument from other locations on very specific days. If the sky is clear, anyone can see these events, which are living proof that 'someone' went to significant pains to make the Washington Monument 'what' it is, and exactly 'where' it is. If you want to know more about this incredible discovery, read on. It all begins with the Washington Monument, one of the most amazing structures ever created and an undoubted wonder of the modern world. The Monument stands on the Mall, an open area that extends westward from Capitol Hill to the Lincoln Memorial. The Monument was commenced in 1848 and finished in 1884. As its name implies, the Washington Monument was built to commemorate George Washington, who was the free United States first President and also the general who led the army of the American patriots to victory against Great Britain. The Washington Monument is 555 feet tall and remains, to this day, the tallest totally stone built structure in the world. 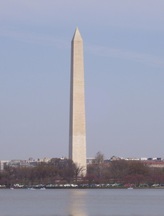 It is a copy of an Egyptian obelisk and is the tallest structure in Washington DC. This picture shows the civic heart of Washington DC from the air. When the city was planned, at the end of the 18th century, it was based upon a right-angled triangle. This would run from the White House down to the Capitol, from the Capitol back to a point directly below the White House and then back up to the White House. (The orange dotted triangle.) The empty corner was intended to be the site of a magnificent monument, dedicated to George Washington. However, the monument was not started for nearly 60 years and when it was, the site chosen for it was not the one originally planned. 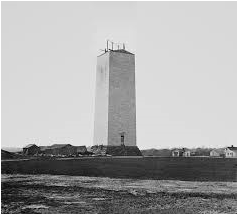 The Washington Monument was placed some distance to the south and the east of its intended position. At the time it was stated that the land on the proposed site was not strong enough to support the structure. I have always been certain that this was a lie, or at the very least an excuse, because those who planned the monument had very specific reasons for putting it where it now stands. I now understand the 'real' motivation for placing the Washington Monument in the position it enjoys today. On September 17th 1787, the Constitution of the United States was signed in Philadelphia by 38 delegates from the various states of the new United States. It was at this point that the independent and free United States truly became a nation. 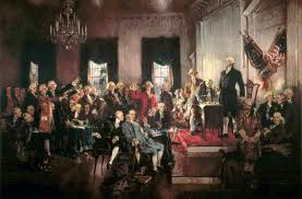 The delegates had been present at the Constitutional Convention for four months - far longer than was stricly needed and there is strong evidence that the actual signing of the document was delayed for some time. I have always believed, and still believe that the reason for this was the fact that many of the delegates were Freemasons and advocates of esoteric studies. To them, September 17th had a particular significance and so they delayed proceedings until this date. As I have shown elsewhere, both on this site and specifically in my book 'Washington DC - City of the Goddess', September 17th was the date on which the Mysteries of Demeter had been held in Greece in ancient times. Much of Freemasonry rests upon the Mysteries of Demeter and the ceremony held on September 17th in Greece for many centuries comprised a symbolic death and rebirth experience for those joining the cult. This was very similar to the symbolic death and rebirth ceremony that all Freemasons undertake when they achieve the third and final degree to become Master Masons. The significance of the Constitution being signed on this day is obvious. It represented the death of the United States as a colony and its birth as an independent nation. It also represented the death of tyranny and the birth of liberty. These are pictures of the Rising Sun Chair. It is the chair used by George Washington at the Constitutional Convention for four months in 1787. This is more than just 'any' chair that happened to be around at the time. Its whole construction is deeply symbolic. There are many esoteric elements to the construction of the chair but the one that that I particularly want to point out here is the Sun that appears on the very back of the top of the chair. There was clearly a genuine significance to the Sun on the chair because Benjamin Franklin who was also present as a delegate wrote about it later. He commented that during the Convention he often wondered whether the Sun in question was meant to be rising or setting and added that he was happy that it proved to be a rising Sun. Being a Freemason himself, Franklin couldn't allow himself to be more specific about the Sun on the chair but he would have been more than aware of what it really meant. If the sky was clear, this is the view one would get from the bottom of the Capitol steps, looking west at 6.43 pm on September 17th in any year. The Sun is at 1 degree south of west and at an altitude of 4.5 degrees above the horizon. What is fairly unique about this picture is that the Sun is standing on the very top of the point of the Washington Monument. This picture is a recreation but it is what would definitely happen on the evening of September 17th. It might be imagined that at some time on every day the Sun would appear to surmount the Memorial from the same viewing point but this is most definitely not the case. For a half of every year the Sun sets before it even reaches due west and at almost all other times, when seen from the Capitol, it either passes the Monument above or below its point. It is only on this day, and one other that I will mention later. that the Solar disc sits, momentarily, when seen from the bottom of the Capitol steps on top of the Washington Monument. This is the torch held by the Statue of Liberty in New York. It is said to represent the light of reason and enlightenment, illuminating the darkness of tyranny and ignorance. Undoubtedly this is true but it is far from being the whole story. 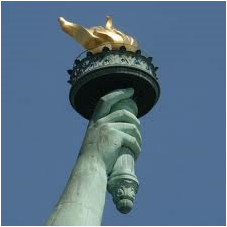 The Statue of Liberty is a Freemasonic construction and the torch ultimately represents the Sun. The original conception for the statue was that it would represent the Egyptian Goddess, Isis. If we think again about the Sun, blazing away at the point of the Washington Monument, that too represents the torch of reason and enlightenment, which is to be specifically commemorated on the anniversary of both the signing of the American Constitution and also of the Mysteries of Demeter at Eleusis in Greece. It means death and rebirth and is the most potent symbol for Freemasons and also for those who became advocates of the Mysteries of Demeter. The obelisk is a very definite Ancient Egyptian invention. Obelisks were created from the very earliest days of Egyptian history. It was believed that they represented a manifestation of the God Osiris - who incidentally was the god of death and rebirth. As far as I am aware nobody has ever checked Egyptian obelisks to see whether they were positioned to ensure that the solar disc rested on top of them at important times. However, the Ancient Egyptians did believe that the in addition to representing the god, the obelisk also represented a petrified sunbeam. Throughout thousands of years nothing was more important to the Egyprians than the Sun. And if the obelisk was a solid sunbeam, it surely would be the case that it 'must' have originally been designed to have the Sun itself standing on top of the point at a significant time. This is a line of research that I intend to follow in the future. We can only guess at the ritual symbolism to the Ancient Egyptians of the sacred Sun passing its power directly into an obelisk. Those who planned the Washington Monument were clearly aware of these matters and they went to immense trouble to plan and build the Monument so that it presented them with the result they required and on the right days. If you stand at the end of the shadow of an obelisk, or indeed any high structure, not including the distance from the ground to your eyes, the Sun will always appear to be on top of the object. This is because of the angular relationship between the shadow, the object and the Sun. It seems entirely plausible that our ancient ancestors believed that the shadow carried the power and magical properties of the Sun to whoever was standing at the end of it. Their comprehension of perspective was very different to ours and as strange as it might seem to us, they probably genuinely believed that the Sun actually was, moentarily, standing on the point of the obelisk. Clearly the builders of the Washington Monument 'did' understand perspective but it is likely that it was the symbolism of the situation that appealed to them. As an example, we still say "God bless you" to people who sneeze but we know very well that the devil is not going to enter the person if we fail to do so. Freemasons are especially drawn to ritual and tradition so the replication of an ancient belief is not at all unusual in a Masonic sense. In 1882 an American Freemason by the name of Robert Hewitt Brown published a book entitled Stellar Theology and Masonic Astronomy. It is one of the most important books in my own, personal library and its pages are dog-eared with my continual reference to it. This book taught me, not simply that there are strong aspects of Sun worship included in Freemasonry, but that 19th century Freemasons were well aware of the fact. The origins of Freemasonic history and ritual are complex and did not originate in any specific place or at a particular time. They represent a composite of ancient beliefs, merged together to create what is, to all intents and purposes, a mathematical, geometrical, astronomical and religious soup - topped off with a layer of symbolism and allegory so deep it is often impossible to see what lies beneath. In amongst all this, the Sun plays a very important part. It is mentioned in Freemasonic ritual and depicted time and again in Masonic iconography. 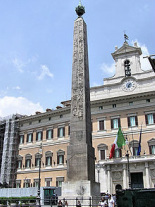 The obelisk on the right is known as the Obelisk of Montecitorio and is to be found in Rome. 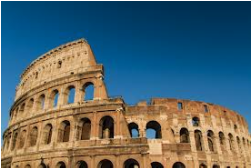 It came originally from Egypt during the reign of Rome's first and most powerful Emperor - Augustus. (Caesar was never officially an Emperor). Augustus reigned between 27 BC and 14 AD. The obelisk was placed on a special platform in Mars' Field and was used as an elaborate sundial. However, it also served another purpose. On September 23rd, which was Augustus' birthday, the shadow of the obelisk fell on the Temple of Ara Pacis. Pacis was a Roman goddess and a favourite of Augustus, who was a chief priest of her cult. It is clear that the designer of the sundial fully intended this happening to take place and since it was noted by the Roman historian, Pliny the Elder, it is likely that the Obelisk of Montecitorio appealed to Freemasons in Washington DC when the time came to plan the Washington Monument. Early planners of Washington DC, and especially the Freemasonic ones were very captivated by Roman History. The word Capitol is Roman, as is the idea and word for the Senate. The combination of Roman and Egyptian symbolism and religion inherent in the Obelisk of Montecitorio would certainly have appealed to them greatly. In addition, George Washington was often equated with the Roman Emperor Augustus. Had he not been such a modest and politically astute man, as well as a Freemason, he could undoubtedly have become a King himself. Both Augustus and Washington are remembered as creating a golden age for their people, so the connections with the Obelisk of Montecitorio are significant. This small stone is all that stands on the intended site of the Washington Monument, as proposed by the designers of Washington DC. It is known as the Jefferson Pier and it marks the meeting point of the east west line from the Capitol and the north south line from the White House. (at least it is supposed to do so.) The original Jefferson Pier was put in position at the instructions of Thomas Jefferson, whilst he was President between 1801 and 1809. However, the story goes that after the American Civil War, the original Jefferson Pier was lost and it wasn't replaced until 1889. Although it is not generally known, I believe that the new Jefferson Pier was deliberately placed around 10 feet to the West of its original position - which is almost certainly why it was reported to have been 'lost' in the first place. The original Jefferson Pier could not have been instantly relocated without someone asking difficult questions. However, nobody would notice if a replacement was in a slightly different place after a gap of several years. Why was the Washington Monument Site Moved? It was suggested at the time the Washington Monument was commenced, in 1848 that it could not be built on the site of the Jefferson Pier because the land there was not stable enough to hold the massive monument that was planned. My friend, the documentary maker, writer and geologist Scott Wolter thinks this was nothing more than excuse. The site was only moved around 400 ft and Scott comments that the land where it was built is almost certainly identical to the land where it wasn't! So, there must have been some other reason for placing it in a different spot. If we think again about that September 17th alignment, in which not only the Sun can be seen on top of the Monument from the Capitol steps, but also the shadow of the Monument reaches the Capitol at the same moment, we need to ask ourselves if this could have happened if the Washington Monument had been placed where it was originally intended to be. In fact it could not - or at least not if the effect was to be spectacular. This picture shows where the Washington Monument was actually built and also indicates the Jefferson Pier, which is roughly where the Monument was supposed to be. The difference is around 400ft. As seen from the Capitol the Monument is 1 degree south of west, whereas the Jefferson pier is due west. If the Washington Monument had occupied its originally planned site, it would have been due west of the Capitol. It can be shown that if this was the case, the Sun would not reach true east on September 16th until it was only 2 degrees above the horizon. This being the case, if it was planned to see the Sun standing on top of the Monument on September 17th, the Monument itself could only have been around 300 ft in height, as against its present 555 ft. This would have meant that the Sun was very close to setting over the higher ground across the Potomac River before it contacted the Monument. In any case, a monument of less 300 ft in height would have been totally out of scale and would have been dwarfed by the Capitol dome. Those planning the venture had no choice but to place the Monument 1 degree south of its proposed site (as seen from the Capitol). As a result the whole of the Mall, which the planners of Washington DC intended to run true east to true west, now runs from 1 degree north of east to 1 degree south of west. This is because everything created later, west of the Washington Monument, was aligned with the Monument and the Capitol. The majority of people these days would suggest that Independence Day is the most important day in the US calendar, though the Founding Fathers, amongst whom were many Freemasons, might have had different ideas. 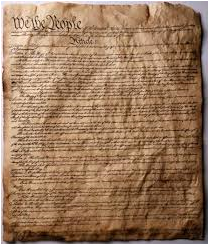 Constitution Day 'was' deliberately chosen and was already a very significant date to the most important of the Founding Fathers. They wanted the solar display over the Washington Monument, as seen from the Capitol, to coincide with this day. This is partly for Freemasonic reasons but also because the United States did not become a true republic until it had a constitution. September 17th comes close to the time of year known as the Autumn Equinox, when the Sun rises due east at dawn and sets due west at dusk. It is for this reason that Washington DC was planned from the start to be orientated east to west. September 17th marks the death of tyranny under the British and the birth of liberty under the new republic. For all these reasons and many more besides, the Sun had to stand on the Washington Monument on this particular day, as seen from the Capitol. It soon became obvious to me that the September 17th solar event, with the Sun standing on top of the Washington Monument as seen from the Capitol, was paired with another such event, which takes place on March 25th. This occurance certainly demonstrates that these alignments are no coincidence, since March 25th is a deeply significant day for many reasons. The picture on the left depicts a Roman God, Sol Invictus, who was the living embodyment of the Sun. Like Jesus, he is said to have been born on December 25th, and also like Jesus, he is said to have been conceived on March 25th. In addition, according to Jewish chronology, the world was created on March 25th - something that early Christians took on board. Probably most persuasive of all is the fact that a god from whom many Christian attributes were drawn was raised from the dead on March 25th. His name was Attis and he has much in common with Mithras, a Roman counterpart of the Greek Atiss and like Attis and Sol Invictus, a god with Solar associations. It stands to reason that the solar phenomenon seen from the Capitol on March 25th, like the September 17th event was 'programmed' into the Washington Monument from the start. It would have been highly significant to knowledgeable Freemasons in 19th century America. Some years after the Washington Monument had been built it was decided to reclaim land at the West end of the Mall in Washington DC and to build other impressive monuments upon it. 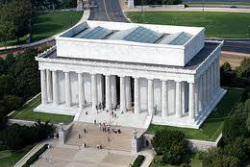 The Lincoln Memorial, which stands at the far western end of the Mall was commenced in 1914 and completed in 1922. It is obvious that the secret of the Washington Monument had not been lost during the intervening period, for a very important reason. The American Civil War ended on April 9th 1865, when the Confederate forces surrendered. The whole of the war took place under the Presidency and the command of Abraham Lincoln and its end marked the crowning glory of his time in office. He was tragically assassinated only a few days later. Anyone standing at the bottom of the steps of the Lincoln Memorial, looking east along the Reflecting Pool, an April 9th, at 7.38 am, would see the Sun on the point of the Washington Monument, at the same time as the shadow of the Monument reached their position. This is not a random chance event. The site of the Lincoln Memorial was manipulated at the planning stage to make this effect possible. Once again it speaks of death and rebirth - the death of many thousands of American soldiers and sailors, and the birth of a truly United States. 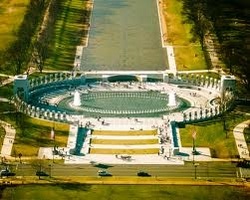 This is the World War II Memorial in Washington DC. It stands on the Mall between the Lincoln Memorial and the Washington Monument. The WWII Memorial is a very recent addition, having been opened in 2004. Once again the shadowy influence of 'someone' in a very influential position within Washington DC becomes obvious when we consider the positioning of this structure. 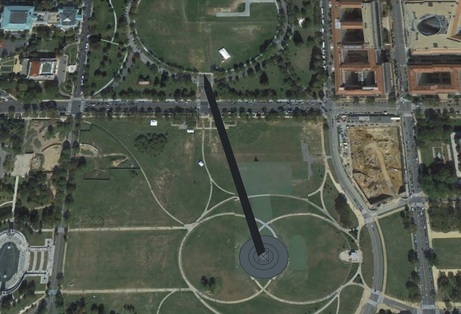 Anyone standing at the centre of the western side of the Memorial, looking east across the central pool, at 8.16 am on August 15th would see the Sun stand on the point of the Washington Monument. Once again this happens as the shadow of the point of the Monument reaches the viewer. August 15th is no arbitrary day. It is known as VJ day and represents the day that Japan surrendered, bringing an end to World War Two. Many thousands of American men and women gave their lives in order to free the world from the tyranny of Nazi Germany and Imperial Japan, and those who did survive gave a big chunk of their youth. As in the case of the American Civil War, a great many Freemasons fought in the war and the solar phenomenon on August 15th is most probably meant as a special tribute to them - even if almost none of them are aware of the fact. In this picture of the Jefferson Pier (mentioned above) the base of the Washington Monument can be seen in the background. Nobody was closer to Independence than Thomas Jefferson, third President of the United States, one of its Founding Fathers and the man who wrote the Declaration of Independence. It is especially fitting then that at 10.55 am on July 4th, as seen from the Jefferson Pier, the Sun stands on the point of the Washington Monument and the point of its shadow falls on the Jefferson Pier. Here then is the reason why the original Jefferson Pier 'had' to go missing and be replaced by a later example, placed in its present position after the land surrounding it had been landscaped. Nobody remembered 'exactly' where the original stone had been. It was replaced at the instruction of Colonel O H Ernst, an army engineer who was also a very talented astronomer - and most probably also a Freemason. 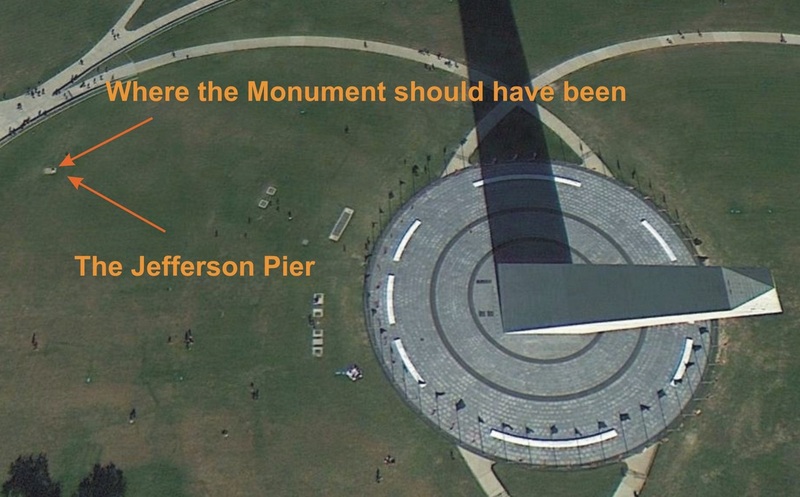 If the Jefferson Pier had remained it its original position, the solar disc would not have stood on top of the Washington Monument on July 4th when seen from it. 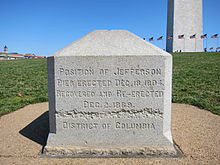 It was not replaced until December 1st 1889, over a year after the Washington Monument was opened, leaving time to judge the exact spot for the replaced Jefferson Pier. This is a recreation of what takes place at 11am on December 25th. 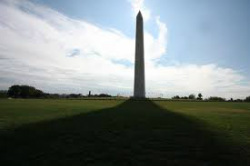 The shadow of the Washington Monument touches the edge of the Ellipse at the very centre of the southern path. It was made possible because of the shape and position of Ellipse Park, which was not created until 1867, 19 years after the Washington Monument was commenced. I have written extensively about the signifiance of the Ellipse and it is specifically mentioned on this website if you go here and here. It now becomes clear that the size, shape and positioning of the Ellipse was carefully handled to allow this December 25th happening to take place . If we consider the Monument in its phallic context and the Ellipse as a womb, with the birth canal the southern entrance, the symbolism of the situation is apparent. There was no day more potent to almost all of the old religions of the world than the day of the Winter Solstice. Not only did it represent the 'death' of the winter and the 'birth' of the returning Sun, it was also considered to be the time at which sexual communion took place between the Sky - in the form of the Sun and the Earth. The child conceived at this time was represented by the bounty of nature nine months later in the following Autumn. There is significant proof that the Ellipse itself was specifically designed so as to allow this December 21st happening to take place. The Ellipse is not placed centrally on the plot it occupies and it could indeed have been a circle if its designers had wished. The truth is that it was specifically designed and placed so as to allow this magnificent December 21st event to take place. As long as the sky is clear it happens every December 21st and yet it is unlikely that anyone ever notices - unless of course they are already aware of the event. When The free United States was founded in the late 18th century, it took many of its models, both in terms of architecture and the elements of the State from Ancient Rome. Its political structures were direct copies of the Roman ones, with the Capitol and the Senate being Roman words for Roman-like institutions. Of course there were also great differences but the desire of the Founding Fathers to adopt Roman models cannot be denied. So, in addition to accepted what Ancient Rome had to offer in terms of administration and the style of composition of its buildings, did Washington DC also incorporate into its secret attributes parts of Roman religion and belief? 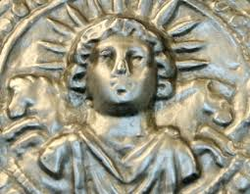 I have already mentioned one important Roman deity, Sol Invictus, who represented the Sun and who was said to be reborn on December 25th. Bearing in mind the solar nature of what takes place on the Mall, Sol Invictus - the Conquering Sun has to be a prime candidate, but he is far from being alone. Another prime candidate is Mithras, a formerly Persian deity who had much in common with Sol Invictus and the later Jesus and who was also said to be born on December 25th. 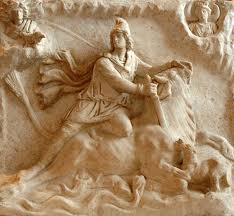 Mithras, in turn, is closely associated with Attis, another dying and reborn god who was celebrated on December 25th. 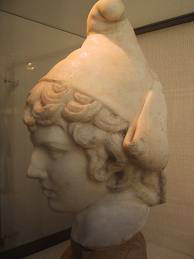 Mithras was worshipped in Rome and as can be seen in this picture, he wears the Phrygian cap, otherwise known as the Liberty cap, which was so popular in both Revolutionary France and the United States at the time they fought for their freedom. This is partly because most of the dying and reborn gods of the Ancient world were said to 'set their followers free' but freed slaves in the Roman Empire also wore a cap like this as a mark of their freedom. 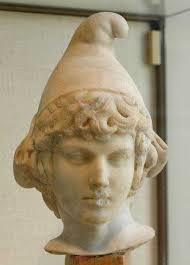 Here is Attis in his Phrygian Cap. He is probably the most likely candidate for the founders of Washington DC because there are not one but two days on which relevant dates of his worship and legend are incorporated into the solar disc and shadow appearances. This is because in addition to September 17th, at which time the solar disc can be seen on top of the Washington Monument when viewed from the Capitol, and when the Monument's shadow travels right down the Mall, the phenomenon is repeated on one other day. As mentioned above, that date is March 25th, which has a special significance in the case of Attis. In the Ancient world Attis was especially celebrated on March 25th, which was said to have been the day he rose from the dead. Like many of the dying and reborn gods Attis was sacrificed for the sake of humanity. This was said to have taken place on March 22nd. And just like Jesus, Mithras and some of the other dying gods, he rose again three days later, in this case on March 25th. Of course the early Christian Church denied that Attis had anything to do with the story of Jesus' death and resurrection, and they still do, but there is no doubt that the stories of Attis predated Christianity by several centuries. Like Mithras, Attis was a solar deity. He was said to have been born of Nana, who was a virgin. He was referred to as the 'saviour of humanity' and was celebrated by his followers symbolically eating his body in the form of bread. It is interesting to note that in the Christian Church March 25th is celebrated as the Annunciation of the Virgin Mary. This was the time when an angel of God visited Mary and told her that despite being a virgin, she was going to give birth to a son. I have come to understand over the years that the early Christian Church almost always managed to place a significant celebration of its own on any date in the calendar that had been important to any of its rival faiths. This example and its nature, on March 25th, is obviously significant in terms of the Attis story. On the left is a detail of the statue of Armed Freedom, which stands high on the dome of the Capitol in Washington DC. She wears a helmet but that's not how she was intended to be. Originally she was going to wear the Phrygian Cap but the sculptor was prevented from using the device because at the time the statue was ordered, the Secretary of State was Jefferson Davis, who would eventually become the President of the Confederate states during the American Civil War. His views on slavery and freedom dictated the statue's final appearance, since the Phrygian cap is also known as the Cap of Liberty and he was an advocate of slavery. This is a relatively modern representation of the Goddess Columbia, who is, herself a version of the Goddess Liberty, who was a Roman deity. This example is from as recently as the Second World War and was meant to inspire patriotism. Note that Columbia in this picture, as in many other examples, is still wearing the Cap of Liberty. It is an enduring theme from the very early stages of the American Colonists sense of anger with their British overlords. The same cap was also used in revolutionary France - but the American Revolution came first. 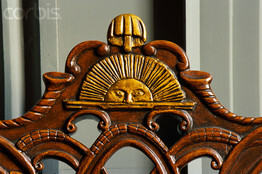 On the back of the Rising Sun Chair, used by George Washington at the Constitutional Congress (mentioned above) is what looks like a mushroom, above the Sun and also picked out in gold. This is actually a Liberty Cap Mushroom, (Psilocybe semilanceata). It's placement in the carving of the chair is very telling and very relevant. In discussions regarding the chair the mushroom is rarely mentioned but to those in the know it's placement above the Sun is important. However, George Washington would not necessarily have wanted all the delegates present to know what it meant. Above on the right is another picture of Attis, a solar deity wearing the Cap of Liberty. The symbolism on the chair now becomes quite obvious. These gods, Attis, Mithras, Sol Invictus and the rest not only represented the Sun to their followers - they effectively 'were' the Sun. The point is made in a not too subtly symbolic way on the Rising Sun Chair. Could all the solar alignments on the Mall that turn up on such significant days have happened by chance? Absolutely not! When seen from the same place of observation, the Sun rarely grazes the top of the Washington Monument. On each successive day the Sun either gets higher or lower as it travels past a particular point. Most of the observations are within a degree of east or west and for half of every year the Sun in Washington DC rises south of east and sets south of west, meaning that these summer and autumn alignments could not happen in any case during winter. The fact that all these events take place on significant dates and from locations directly related to those dates proves absolutely that these happenings were very carefully planned. Whoever it was had to be very powerful, and it could not have been the same person or people in all cases, because the time scale is too long. The Washington Monument was built in the 1860's, whereas the World War II Memorial only opened in 2004. The people concerned must have been able to coerce politicians, as well as having the ability to influence committees and enquiries at every level; they must also have had a strong input into city planning and in order to achieve all this, they were probably very wealthy. The prime suspects have to be Washington DC's Freemasons, specifically the Scottish Rite. Until fairly recently Freemasons were represented in nearly all influential departments of cities and federal government. In many cases they probably still are, though there is less inclination these days for Freemasons in public office to acknowledge their Masonic credentials. Only Freemasonry had and still has the ability to reach into every possible department and company. Add to this the fact that the whole concept is extremely Masonic in nature. It requires a combination of ancient knowledge, astronomy, mathematics and geometry - all of which lie at the core of Freemasonry. Unless there is some unknown group or organisation, which has managed to keep its identity a total secret for a couple of centuries at least, Freemasonry is the most obvious candidate. So Why Keep it Secret? Consider what is actually taking place here. 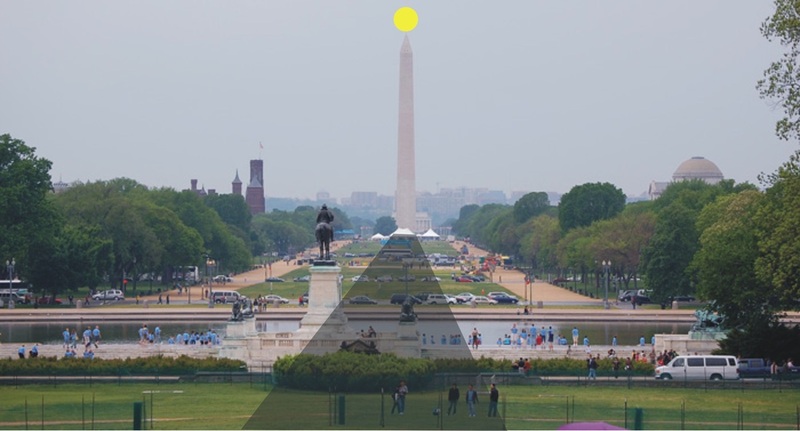 These carefully created solar alignments with the Washington Monument owe absolutely nothing to Christianity but are closely associated with Sun worship and with Pagan Mystery religions from the remote past. It isn't simply these days that the Christian Church (especially the Catholic Church and some Evangelical denominations) has severely criticised Freemasonry. This is something that was going on in the 19th century - maybe to an even greater extent than it is now. Freemasonry does not consider itself to be a 'Secret Society' but it does admit to being 'a Society with Secrets'. It would appear that the true importance and relevance of the Washington Monument has been one of them. It must also be a fact that even very few Freemasons are aware of what has taken place. Those involved could only be from the upper echelons of the Craft - people whose confidentiality is not remotely in doubt. Had it been otherwise it is inconceivable that such amazing revelations would not have become general knowledge. What we are looking at here is a conspiracy of silence. I cracked the code not because of anything I learned from Freemasons, but because of my astronomical and geometrical knowledge, together with a skill I have gradually acquired of knowing what to look for. I for one am elated that these alignments were programmed into the Washington DC Mall. They do point to ancient beliefs - but not to any 'specific' religion or denomination. In many respects they are the product of reason and represent an understanding of astronomy, geometry and mathematics. They serve to demonstrate whatI have known for a long time. Washington DC is a very special place.